With Jasper being released yesterday, I wanted to make a cake in celebration. It would be filled with some of my favorite things: hazelnuts and cream cheese frosting. I would make it myself. And most importantly, it would be amazing. I was not disappointed. I got into the habit of making my own celebratory cakes starting on my 21st birthday. I also made a cake to celebrate my boyfriend’s and my shared birthday. It seemed appropriate to do the same here. This is a simple chiffon cake recipe, with a simple cream cheese frosting. 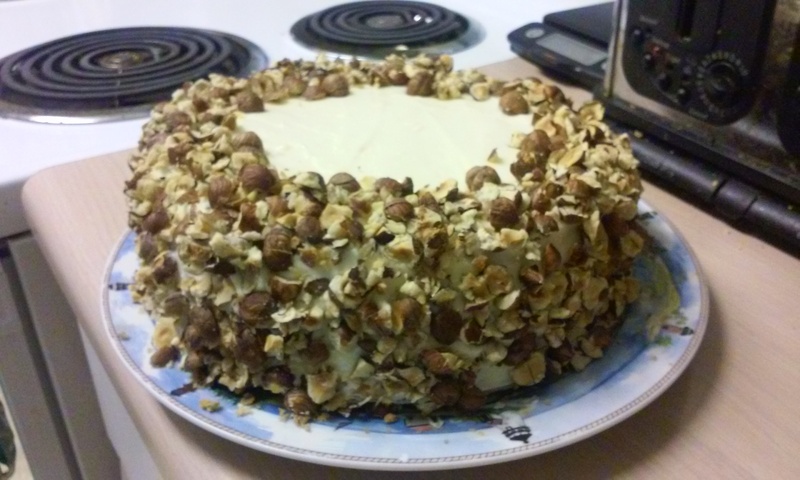 The cake is a bit more labor intensive than other recipes, but it’s worth that in the end. I bought the hazelnuts raw and roasted them myself. Hazelnuts are an awfully underrated ingredient. It’s a rare moment when they’re seen as its own flavor, and not a compliment to coffee or chocolate. Even in the specialty grocery store where I work, my options were limited unless I wanted a nutella-flavored cake. I have nothing against nutella, but it wasn’t what I wanted here. Walmart actually came through and offered a hazelnut extract. You can toast the hazelnuts before or after crushing. Spread in a single layer across a shallow pan and put in the oven at 325 degrees for roughly 10 minutes or until they’ve turned golden brown. If you crush before roasting, expect a shorter cooking time. Keep the oven at 325 for your cake. Prepare your baking pans by greasing the bottoms only. Don’t grease the sides, as your batter will need to cling to the pans as it rises. They’ll still come out of the pans, I promise. Add the dry ingredients to the wet in thirds, folding into the mixture as you go. Go gentle with this step, or your batter won’t be as light. When you’re done, you’ll have a small amount of thick batter. This is fine. It’ll be lightened in the next step. Whip the egg whites and 3 oz sugar into medium peaks. Fold this into your batter in thirds, again as gentle as you can. Divide the batter into your pans and bake for 30 minutes or until golden brown and the center springs back when touched. Mix together cream cheese and butter until uniform. Slowly add the powdered sugar and vanilla. Mix to combine. Once the cakes are cooled and iced, use the crushed hazelnuts to decorate the sides and top. Hope it tasted as delicious as it looks! It definitely did. Thank you!